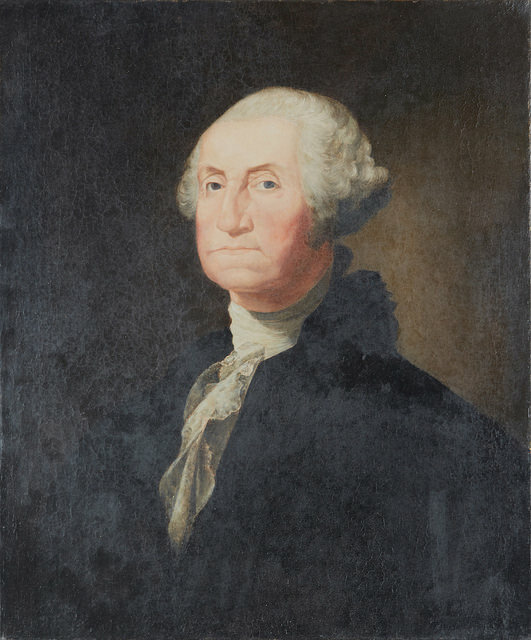 The face of our first president, George Washington, has become familiar due to the immortalizing portrait of him painted by Gilbert Stuart in the mid-18th century. What isn’t familiar is the name Jane Stuart, Gilbert’s daughter, who was a painter herself. Although she created her own compositions and even held her own studio in Boston in the mid-19th century, Jane is best known for the meticulous copies made of her father’s work in an attempt to help keep his legacy alive. Recently, one of Jane's copies came through The Center’s doors with a substantial round tear below the portrait's left eye. Jane started her career in art as a child, working as her father’s studio assistant grinding pigments and filling in secondary details of Gilbert’s work. Her father refused to formally teach her, yet she learned his techniques and style by listening and observing attentively while he instructed other students. After her father passed away, Jane moved to New York City to study painting at the New York Academy of Fine Arts. She continued making copies of her father’s work throughout her life, and wrote three different biographical articles about him in the Scribner’s Monthly as an attempt to continue his legacy. By the time she died in 1888, she had also created a legacy for herself. Since Jane Stuart copied her father’s work throughout her lifetime, it is difficult to pinpoint a specific year that this particular piece was created. Nonetheless, when it came to The Center it showed the effects of time. The painting appeared to be executed on a linen canvas. There was a round tear on the portrait's left eye, and drying cracks throughout the piece. Many of the drying cracks exhibited previous repaint. There was additional craquelure throughout the paint layer, many areas of which were insecure and raised. There was a 1/8" loss on the proper left side of the painting, and the varnish was slightly discolored. Most of the painting had been heavily repainted, and the surface was lightly coated with grime and particulate film. Despite the amount of repaint, the client opted for a more minimal treatment to address crack insecurities and the tear on Washington's eye. The frame also exhibited age-related conditions. It was composed of wood, gesso, gold leaf, and bronze paint. The miters were open, and there was a large split in the wood that ran from the left corner all the way to the right corner. The frame exhibited areas of previous fills, and gesso and gilding losses at all four corners. Our Painting Department began their treatment by consolidating the area of tear with an appropriate conservation adhesive. The painting was then surface cleaned to remove grime. Next, the canvas deformations were flattened as best as possible. The tear was aligned and mended using conservation adhesive and bridging threads on the reverse for reinforcement. 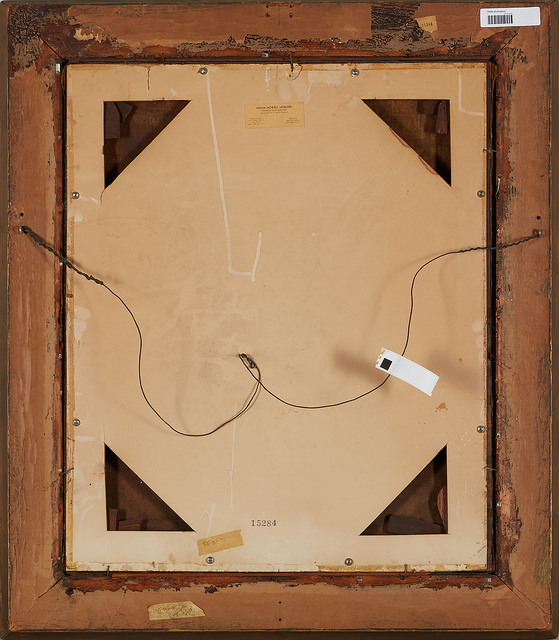 The stretcher was then keyed out to provide adequate tension for the canvas, and losses were filled and textured. After an isolating varnish was applied to the paint layer, inpainting was carefully carried out in areas of loss and abrasions using reversible conservation paints. Lastly, a final coat of varnish was applied to integrate the surface. Meanwhile, our Gilding Department was hard at work on the frame. After stabilizing the miters and joints, they repaired the split and consolidated the cracks and losses. The frame was surface cleaned on all sides, and scratches and abrasions were inpainted to emulate the surrounding surface. Lastly, a layer of microcrystalline wax was applied to the surface. After the portrait was reinstalled to its existing frame, our conservators added an archival Coroplast backing board for extra protection. The client also elected to add a conservation-grade acrylic plexiglas glazing that protects against UV light rays to further ensure the safety of their painting. A Story Unfolds: Palmer Hayden's "Bricktop"